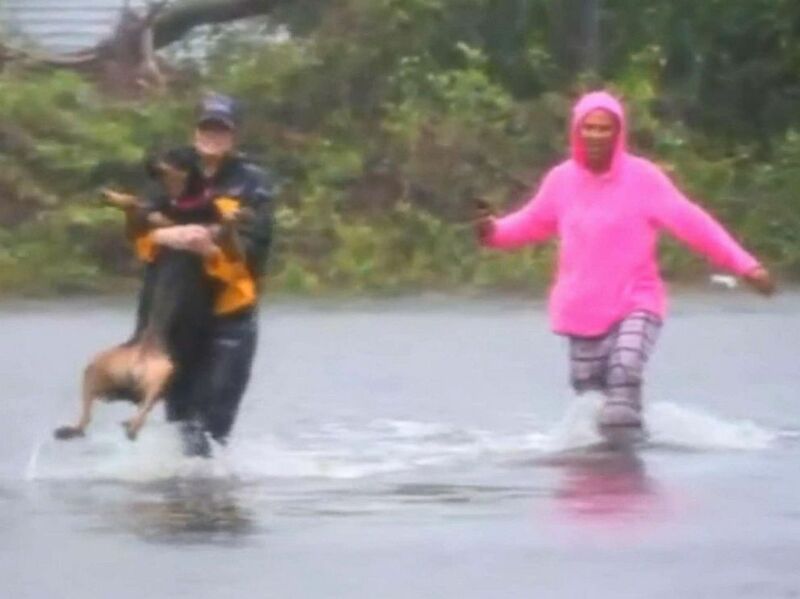 As Hurricane Florence continued to pour down on the Carolinas on Friday, a journalist for ABC local station WTVD who was in the field reporting on the storm found herself rescuing a dog. Julie Wilson was recording a video for Facebook Live about the people impacted by the hurricane in New Bern, North Carolina, when she came across a woman trying to save her dog from knee-deep water. "Do you think that is safe," Wilson asked the woman, who said her name was Tasha. "It's my daughter's therapy dog. I have no choice," Tasha responded. 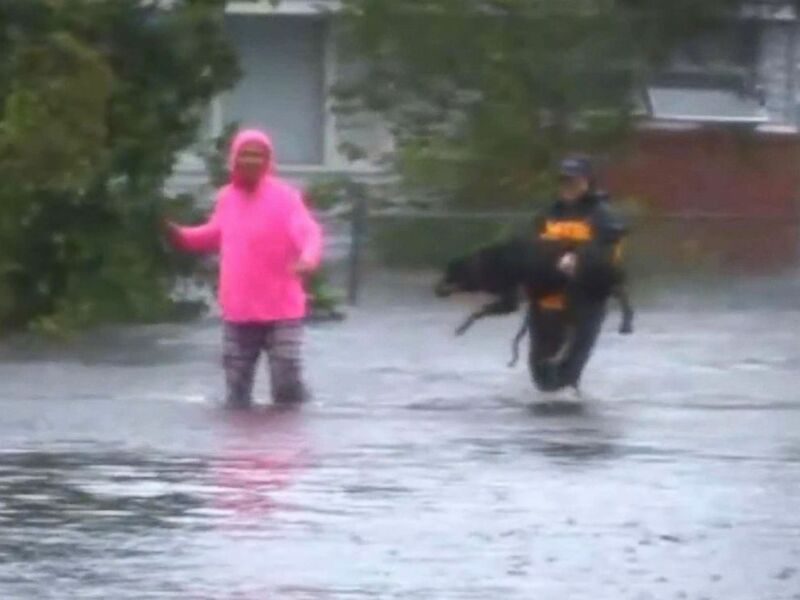 Julie Wilson, a reporter for WTVD, helps save a dog when Hurricane Florence hit New Bern, N.C., Sept. 14, 2018. While Tasha went to recover her dog, a Rottweiler that had been injured, Wilson continues to report on the live feed about her surroundings, which included people floating toward safety on boat. “This is no joke, folks, when they tell you or encourage you to leave,” Wilson said as she waited for Tasha to come back out of her house. Once out, Wilson sees Tasha having difficulty maneuvering with the dog through the water, and asks her if the dog can be carried. "Can we pick this one up?" Wilson asked. Then she asks Tasha to hold the camera as she picks up the dog herself. “You are OK baby girl,” Wilson said to the dog as she carried her to safety. Tasha could be heard thanking her repeatedly in the background. As Tasha and her dog begin walking away in shallower waters, Tasha tells Wilson that her son is still inside trying to save one more. “They are trying to get out folks. They are doing their best,” Wilson said before continuing to report on the live stream. Florence, which was reclassified as a tropical storm on Friday afternoon, has left more than 800,000 people without power. At least five people have been found dead amid the storm's destruction. In Wilmington, North Carolina, there were wind gusts as high as 105 mph, the strongest the city has felt since 1958. Rain will continue to accumulate. Preliminary reports show more than 30 inches of rain in Atlantic Beach, North Carolina, while there are flash flood warnings deeper inland, in Wayne and eastern Johnston Counties, where about 10 inches of rain has fallen already.